I bought a new tent! At first I had difficulties to choose which tent I was going to buy. I’ve had my Jack Wolfskin Eclipse II dome tent for several years, and I have actually been quite satisfied with it. The biggest issue has been the weight. It’s quite a small tent but weights up to almost 4 kg! It´s the poles that have the most weight, because they are heavy glass fiber poles with rubber coating. On the last trip to UKK it also made clear that the tent isn´t so good in any wind. So, I wanted following features in my new tent: 1) lighter than 4 kg, 2) wind proof, 3) roomier, 4) the feature that the rain fly is attached to the inner tent when pitching the tent, so the tent keeps dry when pitching in rainy weather. I first looked at some models of Hilleberg tents, but sadly my economy didn’t give in. At the XXL store they have Helsport tents, quite similar to Hilleberg models, but a little bit cheaper. I actually for a long time considered buying a Helsport tunnel tent. Then I found the Bergans Trollhetta 3 tunneltent at the same store. It was half the price of a Helsport tent, weight around 3 kg, the vestibule was roomie and the tent was made for three persons! At first I was a little bit skeptical because the tent was cheap compared to other tents, but I thought I would give it a try. It was at first difficult to find any information and reviews about the tent, but then I discovered that the tent model is called Bergans Rondane 3 in the U.S. and in some other countries. 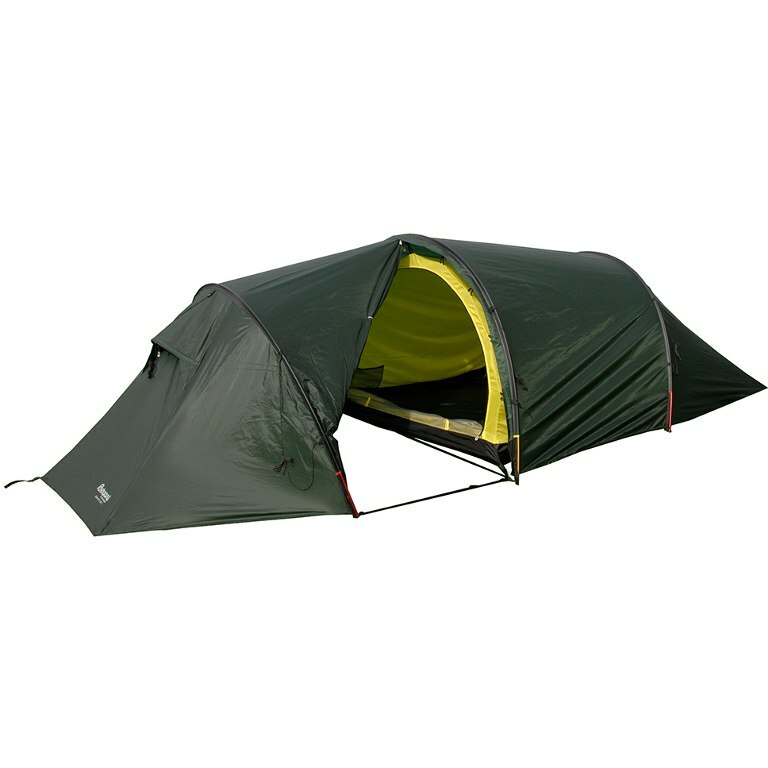 The previous model for the tent was called Bergans Compact Light 3, and it’s quite similar to the new one. I found some good reviews about the tent, and it was clear that the tent also was wind proof. I think that the three-person tent is perfect for two persons, because on long trips it´s nice to have that extra room when sleeping and spending time in camps in the evenings. And of course it´s nice with a bigger vestibule so you have a bigger shelter when you cook and a roomie place to store your equipment over the night. More specs and opinions about the tent come later when I have had time to pitch it for the first time. It was easy to set up, and with snow pegs in the short ends, we got the tent firmly standing on snow. When we pitched the tent the temperature was 0°C or warmer, and the snow was pretty loose. During the night it had snowed and the tent had a a layer of wet snow in the morning and also the rain fly had become looser. We got the tent tight by tightening the guy lines. Inner tent hung still a lot, and it was hard to get tense. In the evening the temperature had dropped to below freezing, and when we tightned guy lines for the night I noticed that the loop that the guy line runs through had frozen solid so that half of the guy rope became loose (see picture). The tent was held tense until the morning because the loop was still frozen, but if the weather would have become warmer the rope would have dissolved and the tent would have lagged together. As previously mentioned, I’m super happy that I chose the three-person tent, because it is really crowded for three persons, but perfect for two. But if you have all your stuff in the big vestibule, there is enough room for three persons. In the foot end, there is not much space, either sideways or upwards, so here you easily kick the inner tent against the rain fly. If you’re tall, the length of the tent can be a problem. If it’s snowing, the heavy snow can push the rainfly against the innertent, and your feet cam accidentally push the innertent against the rainfly. We had both of the ventilation open when we slept, and in the morning there was only a little frosty condensation on the inside of the tent. So in winter conditions the tent’s ventilation works apparently fine. In the summer the dark color of the tent can cause it to be too hot in the tent during calm weathers if the sun shines directly on the tent. Read also the comment section below. Here is a new update of the tent. This time the tent’s fabric is in focus. I pitched the tent on a hot day and the tent looked perfect. The fabric was tense and there were no folds or loose facric. It was over 20°C and the sun shone straight on the tent. Inside the tent it was even warmer. A little too hot. Although I had all the vents open and the door open, it felt as if the air was kept really still in the tent, although there was a slight breeze outside. So this is not a cool summer tent, mostly because of the dark tent fabric. In the evening, when the sun went down and the humidity rose, the tent began sagging together. In the pictures you can compare how the canvas reacts. Now this is just the difference between day and evening. At the night it was even more loose. I also wonder how the canvas then reacts in rainy weather if the fabric stretches this much only of relative humidity.